Octopush is offering a professional solution in SaaS mode (Software as a Service) for sending SMS which does not require any software to be downloaded. 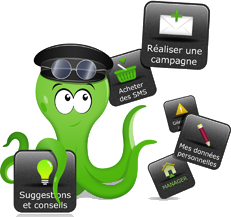 The platform Octopush for sending SMS is a proprietary, robust and tested solution. Octopush manages the dispatch of several million SMS per month on behalf of key accounts, SME, TBP, associations and agencies in France. Agreements with more than 150 operators enable optimum delivery for your SMS	at a national and international level. Create, Send, Analyse and Manage your SMS dispatch campaigns. In need of assistance? A team of marketers is at your service to reply to any questions you may have! read carefully our UTC to handle correctly all the services we give to you. Check our site map and access to the section you chose in one single click !